The Cisco® IP Phone 8851 is a business-class collaboration endpoint that combines high-fidelity, reliable, secure, and scalable voice communications with Cisco Intelligent Proximity for telephony integration for personal mobile devices to support midsize to large enterprise businesses. With the Cisco IP Phone 8851, you can increase personal productivity through an engaging user experience that is both powerful and easy-to-use. 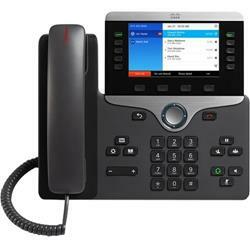 The IP Phone 8851 combines an attractive new ergonomic design with wideband audio for crystal clear voice communications, "always-on" reliability, encrypted voice communications to enhance security, and access to a comprehensive suite of unified communication features from Cisco communication servers.